Logo questionnaire for clients — Spruce Rd. The most important part of my branding logo design process is the questionnaire. This helps me understand the client, develop a strategy that suits their needs and design around their vision. 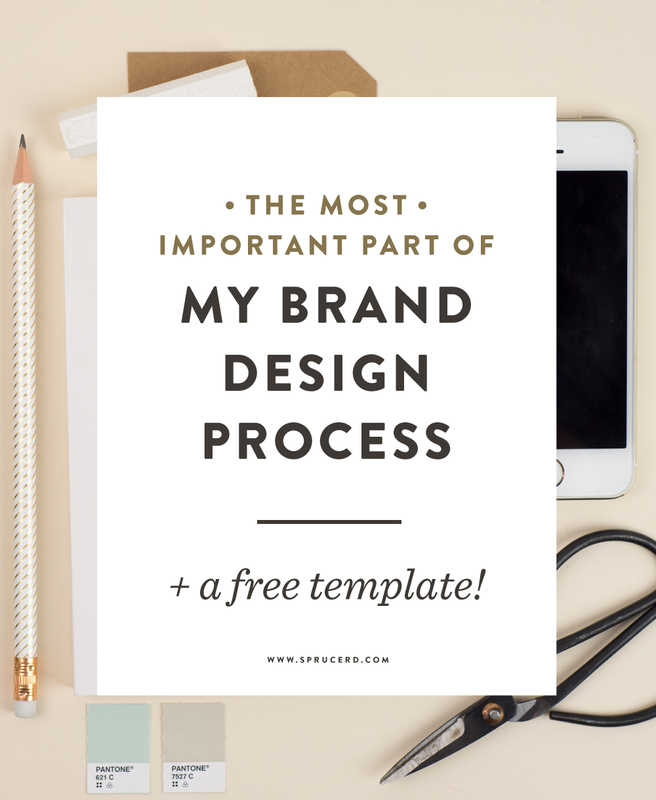 I’m sharing my client branding questionnaire that I send my clients, that has been one of the best processes in my freelance business. I always love peeking behind the curtain of someone’s business, and seeing their process and how it is effective for their business. Over the past few months, I have developed a process that works really well for my clients, and actually hardly leads to any revisions. What is my secret to minimizing client revisions? It is simply just getting to know them. Understand their brand. Gain as much insight to their vision as I can, and present a concept that is a solution to their brand. It all starts with a bit of homework for the client — a branding questionnaire that helps get to the heart of their vision. My client logo questionnaire serves as a simple framework to get our design clients on board before we start sketching. Before dreaming up design concepts, color palettes or brand inspiration, I always start each brand design process with a thorough logo questionnaire. I ask questions like “what is the purpose of your business,” “where does your target audience shop?” down to logistical questions including “how do you want your business name to read in the logo?” Through our client logo questionnaire (download a sample template below), I am able to gain clarity behind the brand. This sets the tone for the entire process, and is a form I reference frequently throughout each stage. This phase is arguably the most crucial step throughout my process. It challenges the client to really think through their business. It shifts the focus from the visuals to their core brand vision. Once the brand questionnaire is complete, I look for repeated words/concepts to give an idea for significant attributes. The questionnaire also allows the client to slow down and really invest some time into understanding their vision. So many times, the client wants to rush the project, and have the logo done… yesterday. This step in the process ensures they take a break and get involved. I also recognize that brand identity design is likely a huge investment for entrepreneurs. I take it seriously, and want to make sure we create something that will last throughout their business, and accurately reflect their goals. Once I receive the client questionnaire, I develop a creative brief that outlines their brand. This serves as a formal checkpoint that the client and I are on the same page. There might be minor changes to this PDF, but it is worth the extra time investment to ensure we are on the same page. Occasionally, once I dive into the inspiration stage of the design process, I will see the client shift focus and reference images that are not in line with the creative brief. This is so easy to get off track, as there is so much inspiration around us! Initially, the client wants a timeless + vintage brand aesthetic, next thing you know they are pinning modern + edgy designs to our shared inspiration board. If this happens, I always pause the project and chat with the client about our inspiration. It is always a tough conversation to have, but it helps to reference the questionnaire and brief for the design direction. If I get the client back on board with their initial brand vision, then we are on the same page. This helps me avoid spending hours on a design concept that isn’t on the right track. I’m a sucker for a well designed brand, however if it lacks concept, strategy or purpose it is elementary. I remember so vividly in design school fighting this truth. “Can’t it just be pretty?,” I would ask the professor. The answer, unfortunately, is no. A brand design without meaning is skin-deep, and won’t last through time. It has no foundation, and it will break down at the sight of the first storm. Rather than diving straight to the computer for design concepts, I prioritize strategy first. This helps inform the design and provide a strong concept. This process also ensures that I don’t fall victim to design trends, and instead that the final brand identity best suits the brand’s needs. Through choosing strategy over design, I also weed out potential clients who want a trendy logo. My brand identity comes with a decent price tag, which attracts businesses that are ready to invest in quality brand design, and are eager to be involved in the process. They recognize that strategy is crucial, and spend ample time completing the questionnaire. They don’t want a logo only, they are looking for a holistic brand experience that enhances their core values. Download my client logo questionnaire sample! I hope this post was useful for you, and that it helped give insight into my process! It is such a privilege to be an advocate for other small business, and I love creating brand identities that take my client’s businesses to the next level. If you are a freelance designer (or thinking about it) I’ve included the questionnaire sample that I use with my clients. You will see, it isn’t anything mind-blowing, but it does get to the heart of their brand. Some of the questions are standard brand design questions, and others dive in a bit deeper. Enjoy!